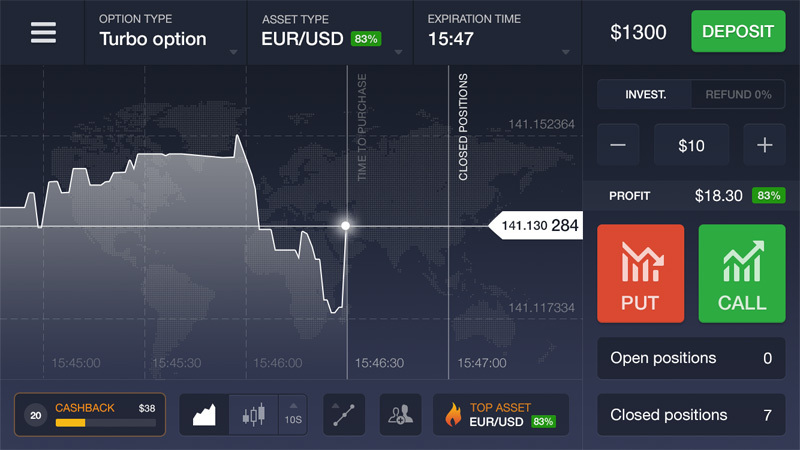 IQ Option is an online Binary Options Broker who have created an amazing website and have developed a complimentary app for both iOS and Android. The team have worked extremely hard on functionality of their site and app, but they have also very seriously addressed the issues of design and ease of use. They are in a cut throat market place, and have made massive strides in finding a niche within that market and making themselves stand out from the rest. For anyone who uses a financial market site, you will no doubt have come across many frustrations if you are trading in more than one asset. This is one of the problems that online brokers have, until now, been unable to fully solve. 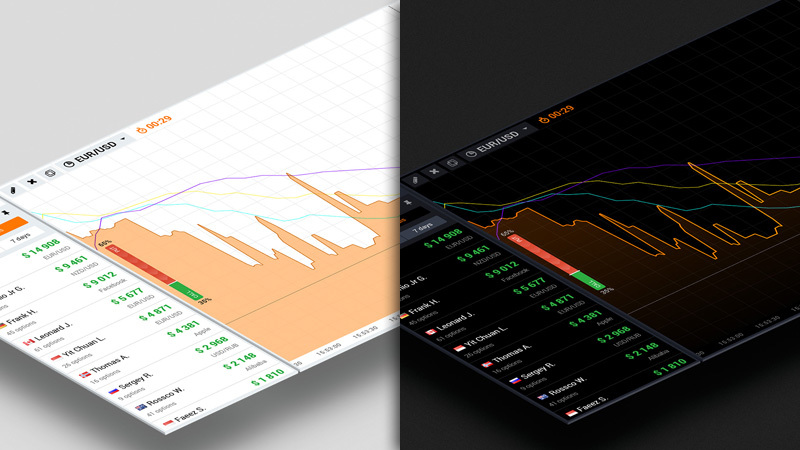 IQ Option have addressed and solved this problem by including the simultaneous display of up to 4 real-time charts on their website. 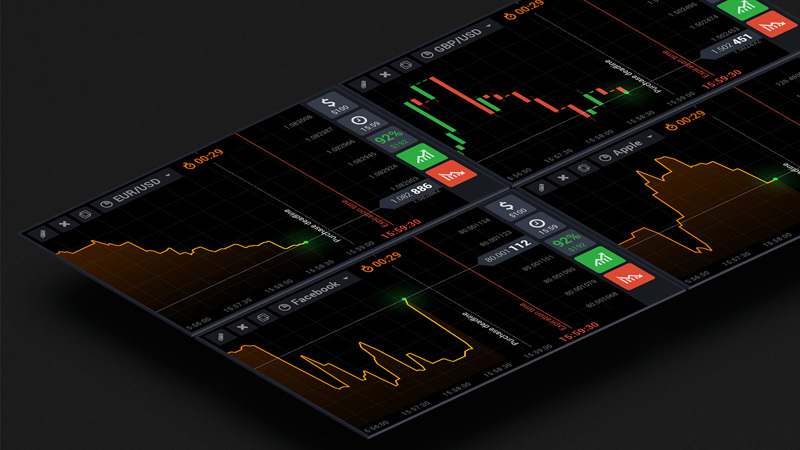 This development allows traders to trade four different assets at-a-glance from IQ Option’s current range of 106 types. You have the choice of a white or night mode, with only the data you need and easy to understand graphics that keep you up to date at all times. With the analytical tool called ‘Signals’ all market trends in automatic mode are displayed on the left side of the graphs, allowing you to follow the direction movement for each asset. It’s not all ‘head down, tail up’ with this site. 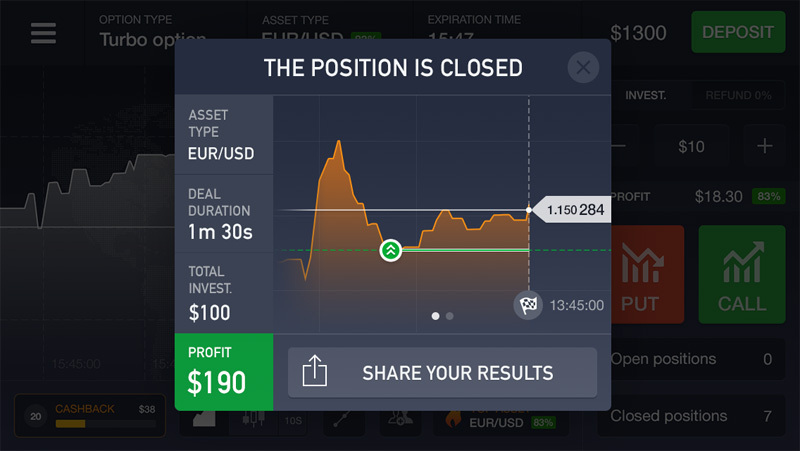 IQ Option have included a fun feature of a tournament where traders compete against each other to have the highest amount in their tournament account by the end of a fixed period of time. The prize fund is collected from the participant entry fees so the best traders get the jackpot! Market News in View: Changes on financial markets are shown directly in the system via a live feed from a financial portal. Indicators and Constructions: Identify trends using visual constructions. 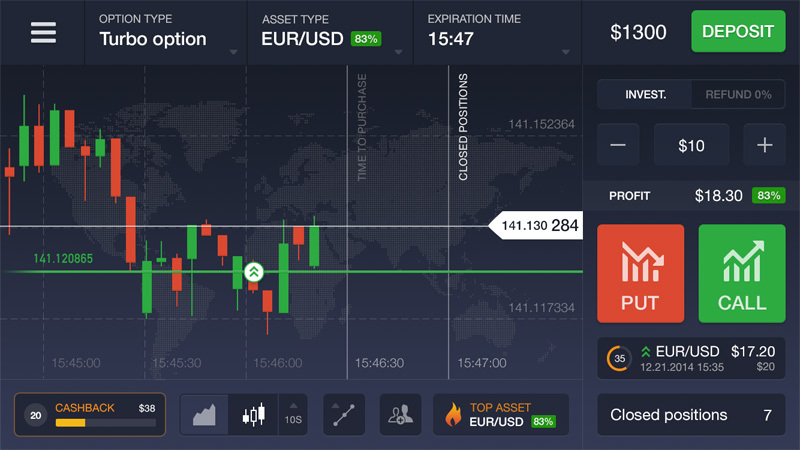 Configuring the Platform for Your Needs: You can adjust the flexible interface for your trading strategy, placing all the items needed on a single screen. Social Networks Integration: You can publish profitable trades on Facebook or VK Wall with a single click. If any of your friends register an account, you will receive $45 into your account as well as 1% of your friend’s turnover. Transaction History: All of your moves are recorded and you can apply to them to follow trends or analyze your strategy. Favorites: You can add your most used assets to a list of favorites and choose your favorite asset to be moved to the top of the list in one click. Demo Account: You can start out with a demo account and you will have access to the same functions as on a full account. 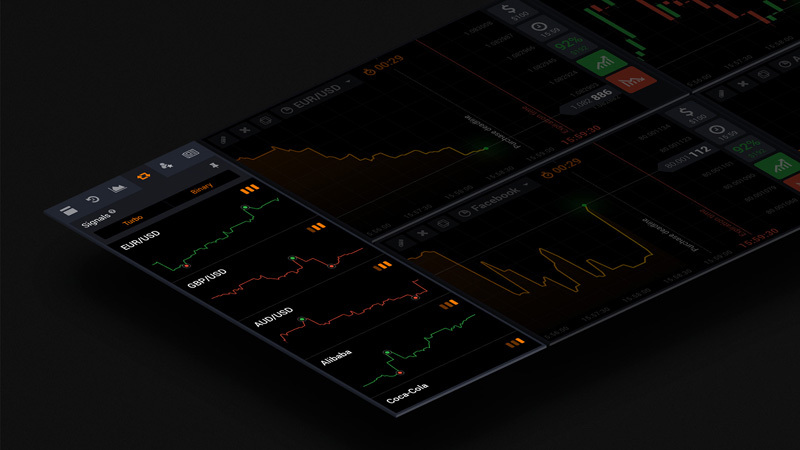 IQ Option have created an app to sit side by side with their website, and they have paid as much attention to detail on the app as they have on their site. 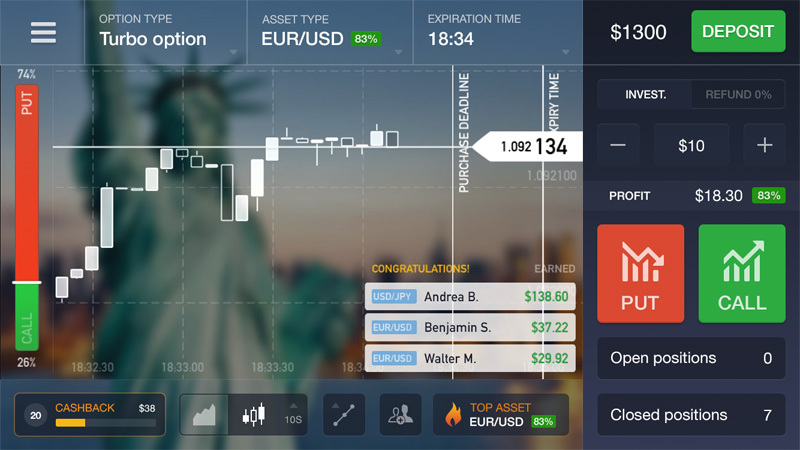 With the aim of making your financial trading as easy on-the-go as it is at home or in the office, the app includes many of the same innovotive features as the site, and the development is ongoing, so things can only get easier! You decide if you want to trade normally, or faster with the Turbo trade option. A special process at the closing of each transaction shows not only the results, but also the animated price movement. You can view the charts that best suit the type of trading and the assets your are trading in, and your personal preference. The team have paid an amazing amount of attention to both the UI and the UX of both their website and their app. Bright, colorful charts, enhanced by real-time reports, at-a-glance information made even easier with the flexible favorites facility, and much, much more – in fact, it has been designed down to the very last detail, and the functionality matches the design in intricacy. 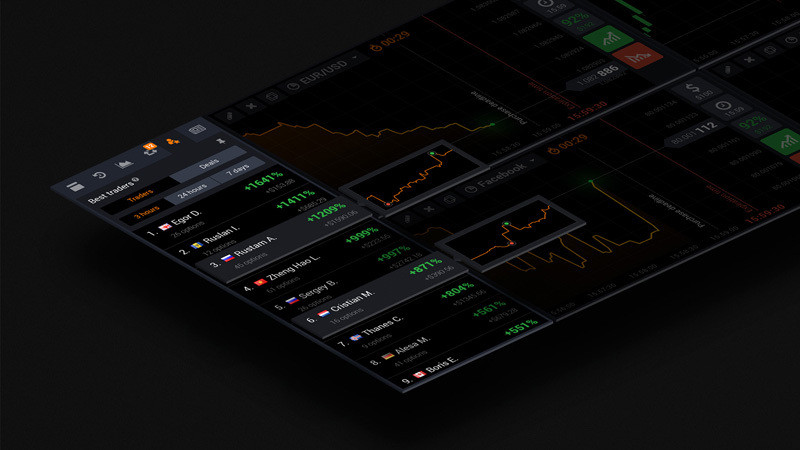 For anyone who trades in the financial markets, IQ Option will not only be a pleasure to use, but will save a lot of time and offer greater peace of mind that everything is being looked after in the best way possible. You can download the app from the App Store for iOS and from Google Play for Android. This app is a testament to great design, functionality, ease of use and user-friendly interface and has addressed problems within their niche market that others have been unable to fully solve. It shows how many designers and developers are like a dog with a bone when working on projects that they know can be improved, and the results, although possibly taking a long time, are something they can be proud of and makes them stand out in their field.